4. whatever random thing happened that we find particularly notable, even if the rest of the world has failed to recognize the significance and hilarity of it...they will. eventually. in other words, we wouldn't normally suggest stopping by here for anything other then nonsense. but today, if your search for the meaning of life landed you here, you might actually be in luck! for not only do we have an answer for you, but we have 20 answers for you and they come from the unlikeliest of sources. yesterday i mentioned that i was taking on the class project for alex's annual school fundraiser: an evening in paris. what i failed to mention is that somewhere in between a laundry list of work demands and actual laundry, i was also out to find the meaning of life. from a bunch of seven-year-olds. on a random wednesday. over my lunch hour. i've already talked about how i agreed to this, then waited until the last possible second to get it done, and struggled with finding an ounce of creativity within me to come up with a money-raising idea. the long and short of it is that eventually i had a breakthrough and the meaning of life was born. let me back up a bit to the summer. this might be hard, but imagine that i was shopping online and i purchased something. it's a stretch, but try. 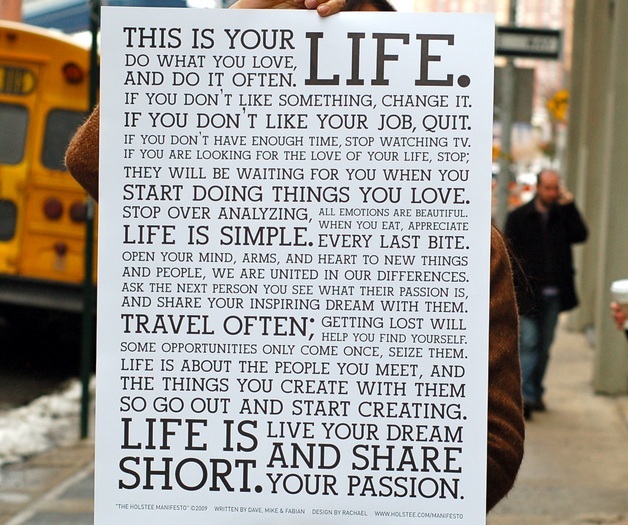 i purchased the holstee manifesto print because it struck a chord with me and i had every intention of framing and displaying it somewhere in our home. and thus the world according to french speaking first graders, the meaning of life, was born. below are a few pics of the process as well as the end result. also be sure to see yesterdays post for an exclusive behind the scenes look at the making of the meaning. oh - and in case you were wondering, some of the most important and well-loved things in life are: the earth, love, pepsi, grandmas, wii games, ku, teachers, the sun, moms, soccer, apples, the ocean, robots, brothers, the green lantern, health, k-state, friends, water, an orange dog and a cat named meatball. It's beautiful, I would even bid on it but I don't have any of the kids in first grade. I'm sure a few of the Moms will love this. Thanks Kelly and I can't wait to see it! Priceless....but I hope somebody comes up with a really, really big number anyway! :-) "Bon chance" with the event!